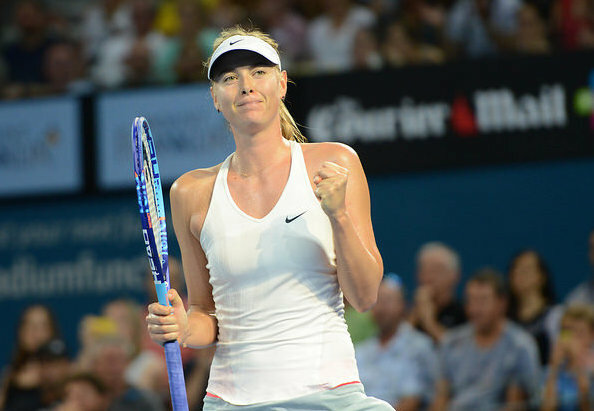 Maria Sharapova has been all business in Brisbane. Photo: Christopher Levy. Writing about tennis in the shadow of yesterday’s attack on cartoonists at the French satirical weekly, Charlie Hebdo, has, for this writer, tempered the excitement as the season begins. Do we exclude words and phrases such as, “blew him off the court,” “served bullets,” or “the season begins with a bang,” when they aptly express court action this week? Do they land awkwardly, given Wednesday’s news? Take the Brisbane International, for example, where the final rounds are set to kick off Friday. Top seed Roger Federer can count his lucky (almost-1000 career-match-win) stars that he advanced. Down a set and a break today to hometown hero, John Millman, Federer admitted, “I thought I got quite lucky. I had to fight hard,” as he clinched in a bit over two hours, 4-6, 6-4, 6-3. Novak Djokovic was not so lucky; Ivo Karlovic took the reins in a three-set tussle across the world in Doha, capitalizing on the only break point of the match to eliminated the World No. 1, 6-7(2), 7-6(6), 6-4. To top off the day, Karlovic took with him a surprising winning record, 2-1, over Djokovic, arguably the game’s best returner. Prowling in other parts of the Brisbane draw are heavy-duty ball strikers, eager for the chance to make noise and ruffle the status quo going in to the Australian Open. Milos Raonic is one. He made quick work of Mikhail Kukushkin today, defeating the slender Russian, 6-3 6-4. The No. 1 Canadian served 17 aces, won 90% on first serves, and 70% on second serves. In his reserved manner, agreed it was a good serving day. The No. 3 seed plays Australia’s Sam Groth next. The two thundered away at Citi Open in Washington D.C. last summer for their only other meeting, shaking the court with what is best described as “big-boy tennis.” It’s a wonder their racquets didn’t split from such powerful performances. Raonic edged Groth that day, but was out-aced by the Aussie. On his end, Groth has grown stronger and smarter since D.C. Just days ago, he took out friend, countryman, and defending champion, Lleyton Hewitt, 6-3, 6-2. The win didn’t go unnoticed. Maria Sharapova doesn’t need much encouragement with her mental game, as she begins her 15th season on tour. She is fierce, steadfast, and locked into her private competitive world from the moment she steps on any court. As the No. 1 seed in Brisbane, she has dropped four games, charting wins over qualifier Yaroslava Shvedova, 6-0, 6-1, and Carla Suarez Navarro, 6-1, 6-3, on Thursday. Ever the perfectionist, the reigning French Open champion immediately commented on her loss to Suarez Navarro last year in Montreal in press. The Spaniard’s ability to both keep balls in play on a slower court, then maneuver around the net upon short shots, is her greatest game plan. On Brisbane’s courts, it was a different story. 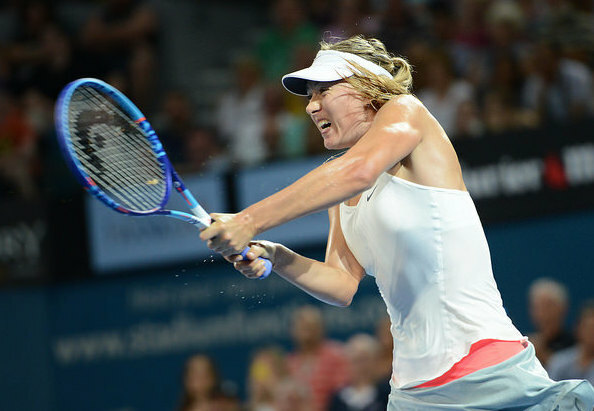 Sharapova has gotten faster, quicker and, if it’s even possible, more aggressive. Quite noticeably so. Rallies were kept to a minimum for maximum efficiency. Her split steps seemed more precise, timed a fraction better, which will make the finest of differences as competition intensifies. In 2014, Sharapova developed a pattern of starting wobbly, only to storm back in the third. Against Suarez Navarro, she made sure she ran with the momentum in spite of an early exchange of breaks. “Of course those little moments are quite crucial in a match,” she said. 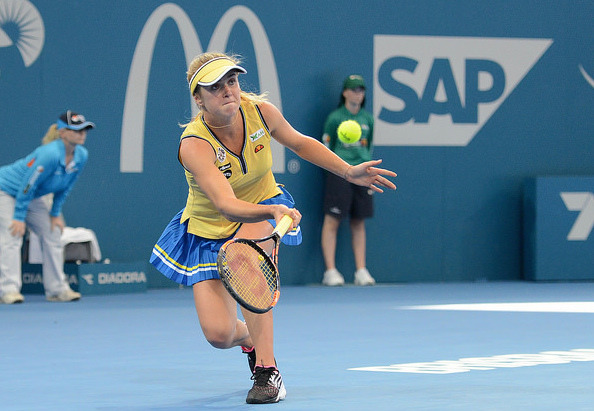 Her momentum will be challenged in the semifinal against 20-year-old Elina Svitolina of Ukraine. Although they have only met once – in Beijing last year where Sharapova won – she must be wary of youngsters in the Top 30. They have to remind Maria of, well, Maria. However, Svitolina’s win over No. 3 seed Angelique Kerber began softly, growing to a roar when Svitolina landed a deft drop shot to win, 4-6, 7-5, 6-3. Kerber was completely in control of the match, up a set and 3-0 in the second, when the mishmash of tennis demonstrated by Svitolina began to gel. She was on a tear from the beginning, but not accurate. You could see the intention, yet the execution was refined slowly. She said she tried to forget the score and play each point as the last. Svitolina has a somewhat well-earned rap about her on-court attitude. She has fidgeted, made exasperated gestures, and generally acted like a teenager (Trop bizarre!). But we all know, a player’s mind bounces out of bounds when that happens, lessening any chances of advancing in a tournament. Sharapova has made an art of not showing any emotions on court; unless, or course, she is questioning the blood pressure of a player she believes is unsportsmanlike. That aside, she will position herself to whack winners and push Svitolina into more intense predicaments in an attempt to rattle her emotionally. That will be the challenge for the Ukrainian. She has game to beat Sharapova. She has enough spirit to fuel a jet. She must, though, remain steady and present to every point.